ST. PAUL, Minnesota – Four years ago, nine freshmen pulled scarlet and white jerseys over their heads for the first time as members of the Boston University men’s hockey team. They came from all over, with hometowns stretching from British Columbia to Northern Europe. In total, there were four from Massachusetts, two from British Columbia, one from Ontario, one from New York and one from Finland. By the start of the 2015-16 season, six of them remained on the roster. Wes Myron left first, departing late in his freshman campaign amid complaints about his ice time to try his hand at starting a pro career. Sam Kurker followed suit 11 months later, opting to head to the United States Hockey League for a season and a half and then transfer to Northeastern University. Matt O’Connor was the last to head out early and signed a professional contract with the Ottawa Senators at the close of his junior season, in which he backstopped BU during its lengthy postseason run. Despite the departures, captain Matt Grzelcyk, assistant captains Danny O’Regan and Matt Lane, forward Mike Moran, winger Ahti Oksanen and goaltender Sean Maguire make up the Terriers’ largest senior class since their freshman season. And they’ve more than doubled that group’s scoresheet contributions, recording 141 points in their fourth year compared to their predecessors’ 66. When their season ended Saturday in a 7-2 loss to the University of Denver during the regional semifinals of the NCAA Tournament, the six took off their jerseys for the last time. Like Quinn mentioned, the group’s time at BU has been one in which each year was starkly different from the others. 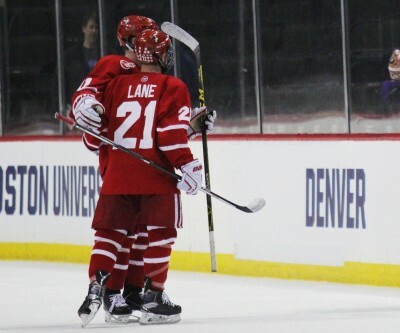 As freshmen, they started the season strong but struggled in the second half, missing an automatic bid into the national tournament in a 1-0 loss to the University of Massachusetts Lowell in the Hockey East title game. That was also former head coach Jack Parker’s final year at the helm, making them one of the only classes in the last 40 or so years at BU to experience a coaching change during their tenure. Their sophomore season was historically one of the Terriers’ worst, as they won a grand total of 10 games in Quinn’s first year as bench boss. The next year, however, was drastically different. It was a “magical” season, as Quinn said, that involved a Beanpot championship, a Hockey East regular season and postseason title, a trip to the Frozen Four and a try at the national championship. In their final year as Terriers, the seniors were continually relied upon to provide boosts from a production and leadership standpoint. It’s repetition from earlier in the season, but their 2015-16 point total served as 41.6 percent of BU’s cumulative sum, and they accounted for 61 of the team’s 124 goals. Even in the Terriers’ 7-2 loss to Denver, their goals were scored by O’Regan and Moran, two seniors. Each of the six seniors stressed how important their classmates have been to them during college and reiterated Grzelcyk’s sentiment of friendship. Great article. Too bad the season had to end like it did. Who was Wes Myron ?? Why do not I remember him ?? Was he on the roster ?? Maybe my mind is going but I follow very closely and do not remember him.